Transformation Underground is a mother and daughter collaborative effort to bring about positive change, following a "pay it forward" concept. They have created PASS IT ON CARDS-- a set of 5 cards that come in a deck. Each card embodies a positive quality, such as generosity, compassion, or kindness. 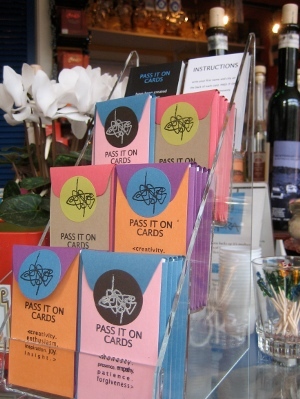 Pass It On Cards on display. Alexis Saloutos: Transformation Underground developed from two separate visions. My husband had just built a studio space for me in our attic. It was filled with so much love and charm that I couldn’t help but be inspired by it immediately. In the early days of working in my studio I had a creative flash, more like a surge. I am a card fanatic with Success Cards, inspirational quotes and other various cards tacked all over my walls. A strong feeling came over me that I should create a deck of cards, but instead of just sitting on a desk to look at, they would serve the purpose of being passed on to inspire others. A pay it forward concept was stirring inside me. Months later my mom paid a neglected tab for someone who stiffed our waiter during a lunch get together. The feeling of doing something kind for another person without the desire for recognition led to the name Transformation Underground. She felt we could pour our efforts into a pay it forward movement that would begin with our family. As we put our minds together, our excitement and joy in following our creative spirits lead to the development of The Pass It On Cards. Transformation Underground rests in a devoted family’s effort to bring about positive change globally. The Pass It On Cards have the potential to shift a perspective of lack to one of great abundance. This alone is life transforming. I believe there is potential for success and prosperity even during slow economic times. When something is created out of love and complimented with a strong work ethic, the possibilities are endless. Small business brings unique ideals and distinguished character to communities across the world. As an owner of a small Mediterranean Specialty Shop (in addition to my other projects) I understand the importance of being supported by a local community. Establishing a strong foundation devoted to giving back is crucial. Because Transformation Underground is dedicated to building a global community, 10% of our profits go to Gua Africa. This organization allows for dreams to become a reality, providing education for war torn youth across Africa. Idea Café regulars should vote for Transformation Underground if they feel their approach to life aligns with our mission to create positive change through a global pay it forward movement. If you believe in the tremendous power of an individual to initiate change, then as a collective we can begin to launch this project! Submitted by Darren Tabor (not verified) on Wed, 12/17/2008 - 20:39. Submitted by domesticathlete (not verified) on Thu, 12/18/2008 - 01:13. The simplicity of something this positive and effective are what make it a wonderful selection. It has a great impact, requires a minimal investment, and yet has a real future as a lasting effort to improve the way folks look at their world.